Facebook Connect & Fan Page Integration – The global community for audio culture. The Mixcloud dev team have been hard at work building out some cool new integration features with Facebook. 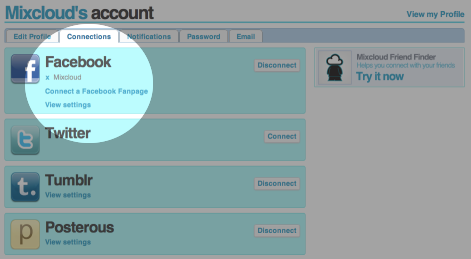 Using Facebook Connect, you can now easily sign-up, login and sync with Facebook. This is a great way to find all your friends already listening to Mixcloud, invite new friends to join the Cloud Radio Revolution and then follow them all for better recommendations, to discover great Cloudcasts and the new music within. The team have also added the ability to sync your Mixcloud profile with any Facebook Fan Page you either own or administer. This means the Fan Page news feed will be updated each time you upload and you’ll also get a MIxcloud Tab for the page, which will effectively become a mini version of your profile, embedding a playable widget of your latest Cloudcast. Sweet! I have just done this for my radio stations’ FB page, but it seems to only be visible on the desktop Facebook, not on Facebook mobile app. Is there a way to access the Mixcloud app on the Facebook page on the mobile version or is it desktop FB only? Hi Nick, the FB app doesn’t have a feature that displays tabs so you won’t be able to see the Mixcloud one I’m afraid. It’s browser only.